It takes an individual to give those occassional bursts. But to shape an orgaisation it takes the collective efforts of many more. Welcome to Shree Rajasthan Syntex Ltd. Founded in the year 1981, Shree Rajasthan Syntex Ltd. (SRSL) is an integrated producer of textile raw materials including Synthetic Spun Yarns, Cotton Yarns and Polypropylene Yarns. The company was established by a young professional team headed by Mr. Vinod K Ladia who is a Textile Engineer with a Post Graduation MBA. The company grew in capacity and size over the last three decades and now employs more than 3500 workmen at 2 different manufacturing facilities in the state of RAJASTHAN in INDIA. 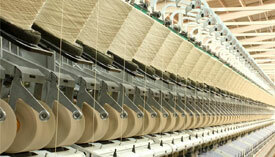 The company produces 2500 MT of yarn every month and has installed the latest state of art machinery in its plants. 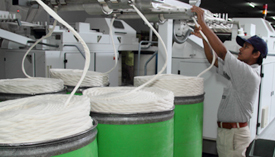 The Spun Yarn business of SRSL was established in 1980. The company producers various yarns including poly viscose blend and carded cotton yarns. The growth of the carpet industry and use of new polymers for yarn production was foreseen in the year 1992. 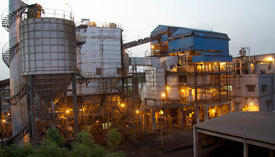 A new plant located at JAIPUR in Rajasthan was set up with technology transfer from NEUMAG Germany. Shortage of power for Industry in INDIA started sometime in the year 1996 with large industrial loads being commissioned in service throughout the country.